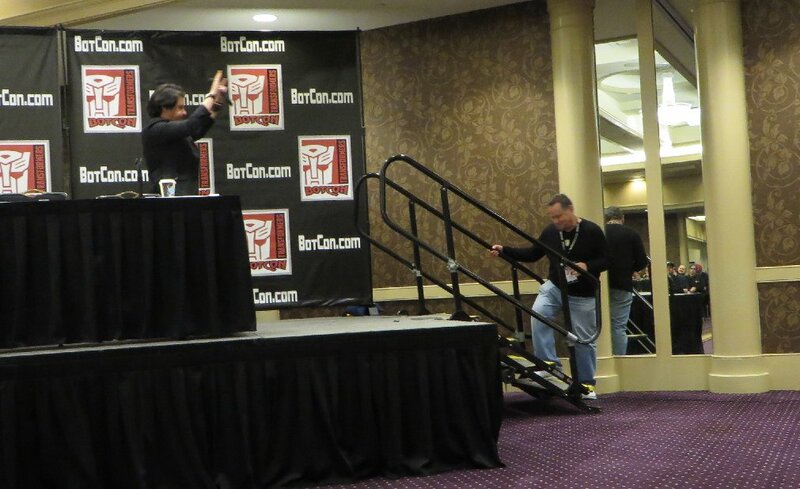 The first two panels today started on time today, while this one started 12 minutes early... but since it was following the Hasbro panel, there probably wasn't anyone skipping the Hasbro panel and coming here at noon and missing a fair chunk of Gregg Berger. Because it started so early, it ended up going almost a full hour, compared to the 45-50 minutes of other panels (to give time between panels). The panel was hosted by Frank Todaro again, but we went straight to audience questions first, and Frank would throw in the odd question as well. 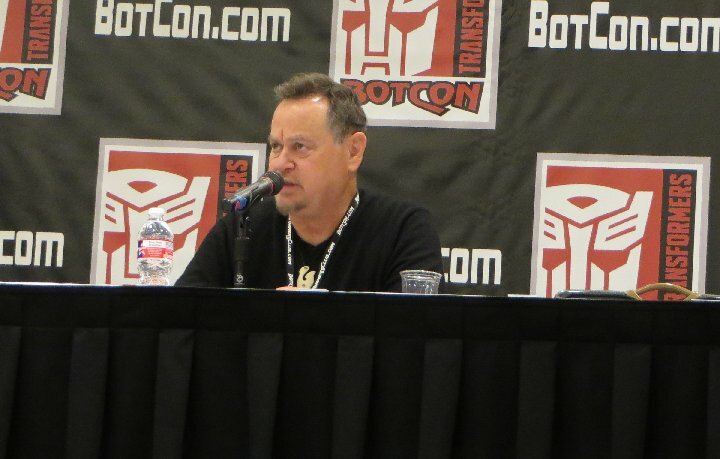 Starts the panel with a line as Grimlock, and recalls when he got the part, Wally Burr asked him if he can maintain that voice, Berger responded with, I'd better as I have my eye on the prize... and he got the part. But he tells others to respect their voice and to be able to maintain & sustain it. He said how he had to exercise and strengthen his voice when he got the role of Grimlock, and continues it like going to the gym to keep the body in shape, as well as protecting it from damage or strain. 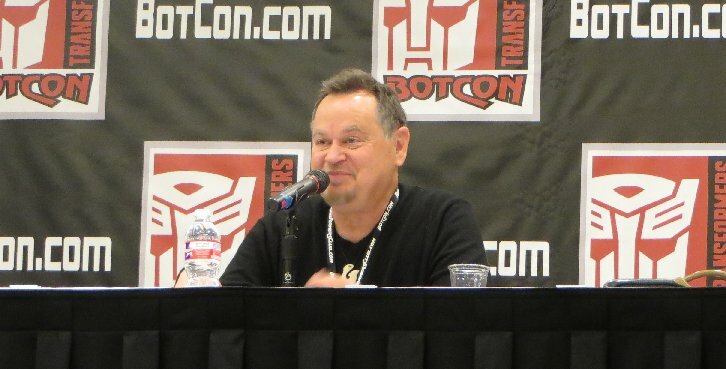 Later he demonstrated how he first created the voice of Grimlock, with various facial expressions to get the sound, and then adjust it into what became Grimlock on the cartoon. 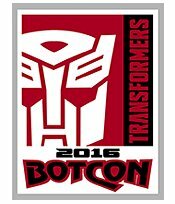 Gregg mentions that he is a Voice Actor teacher, and talks about how he tells his students to always bring your A-game, and always look at a part as being something that will be remembered and respected in decades to come, because that role in Transformers in the 1980s has seen him travel the world and earn parts ever since then because of it. He gives all to his character of Grimlock because he says that it is the gift that keeps on giving, after all these years, getting voice work 30 years later because of Transformers... and just loves his job. When he got the role with Transformers in the mid 1980s, he had only been doing Voice Acting for a few years (he had mostly done TV and film before then), so was still learning, and was in awe of the other voice actors he was working with on Transformers who were heroes of his. He has been doing the voice of Odie since the 1982, and Frank Welker currently does Garfield (after Lorenzo Music died). Also does Agent K in the Men In Black cartoon - one of his favourite productions. He did the voice of Niles Crane's cockatoo in Frasier for three seasons, and a Parrot in Hot in Cleveland. It's hard to pick a favourite character of his, because he puts so much effort into each one, that he loves them all. He commented a bit about the change in recording and technology over his 30 years as a Voice Actor... preferring the method of recording as a group, but most often now there is a lot of individual recording, particularly because of the number of computer games since then. Some lost legends - he spoke about working with Mel Blanc (a VA legend) on The Jetsons, as well as working with Chris Latta (Starscream) who he idolised, Lorenzo Music (Garfield), and Scatman Crothers (Jazz). He also praised the voice director Wally Burr, like all the other Gen1 Voice Actors have, for getting the best out of him, and for creating great Voice Actors that are still working in the industry decades later because of him. Recent Roles - the latest Final Fantasy game, and Eeyore in Kingdom Hearts. His favourite versions of Grimlock - Gen1 & FOC Grimlock. He notes the episodes Grimlocks New Brain and Fire in the Sky as his favourites for the changes or challenges to his character's voice. 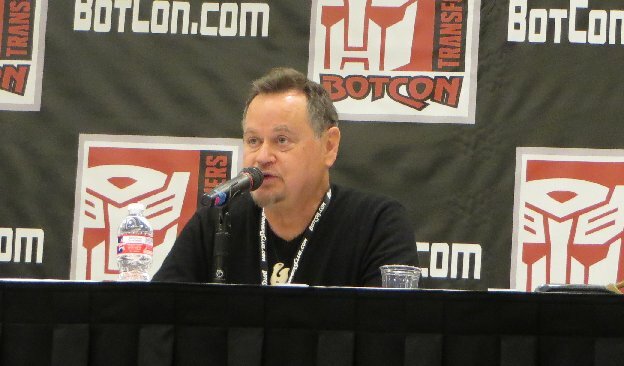 He commented on the new movies, particularly noting the TF4 Grimlock, noting that there was no Voice Actor for the beast noises done by Grimlock (it was artificially generated roars and noises). He called the movies eyecandy, and prefers movies that are story driven or character driven. Would have liked to see the characters developed rather than just introduced. He voiced Movie Grimlock in the Rise of the Dark Spark game, as well as Lockdown after submitting some lines and was offered the part. He talked a fair bit about preparing for an audition and advice on how to get a voice role. Sometimes he watches things on TV that he has done to see how it ended up, but only if it is on, he won't look for his shows. 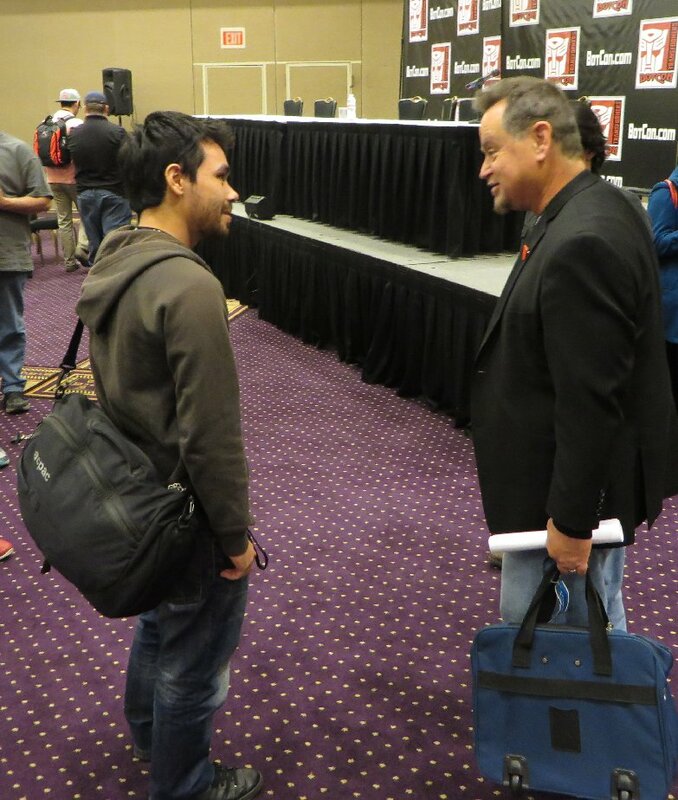 He does conventions around the world, but loves BotCon and other dedicated Transformers conventions best because it feels like he knows the people, particularly when he's just walking around the halls and hotel and just meeting people. 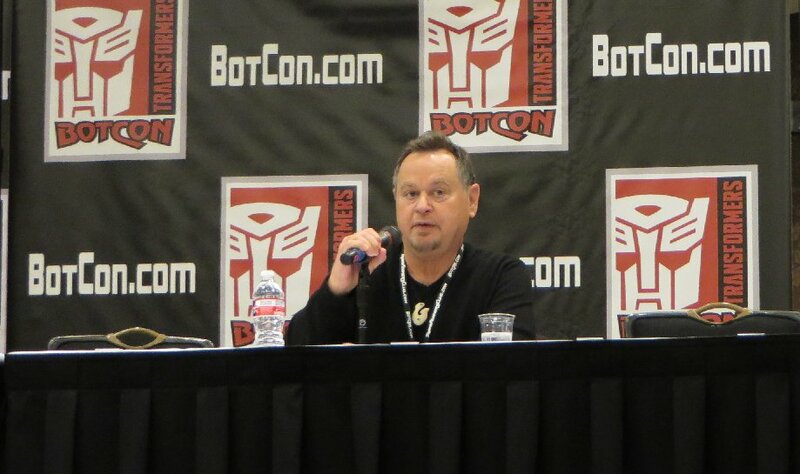 Throughout the panel he did lines from various characters of his, including Grimlock of course. 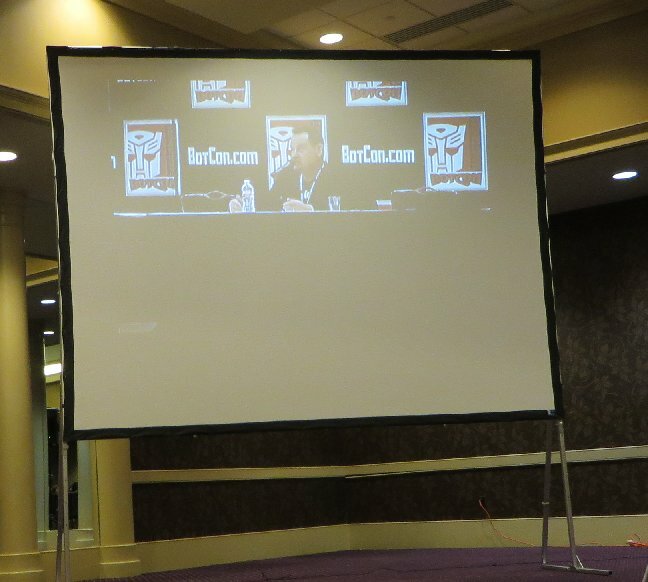 The projector screen was really bad this year, as it is there for people up the back to get a better view of the guests on stage, but this year the image was really bad all weekend. Before the Golden Ticket concept, if I was up the back of the panel room, I would have to sometimes resort to taking photos of the people on the screen, so it was good that I was in the front row for most of this year.